Facebook can be a wonderful place. I have recently been challenged to the 7 day Black and White Photography Challenge. The concept is to post to Facebook a black and white picture that does not contain people and has no explanation about the picture followed by a nomination for another photographer to take up the process. Great to see so many stunning B+W photographs on Facebook and posting here allows the rules to be stretched with an explanation and not have to nominate. This is the first of my 7 photos. 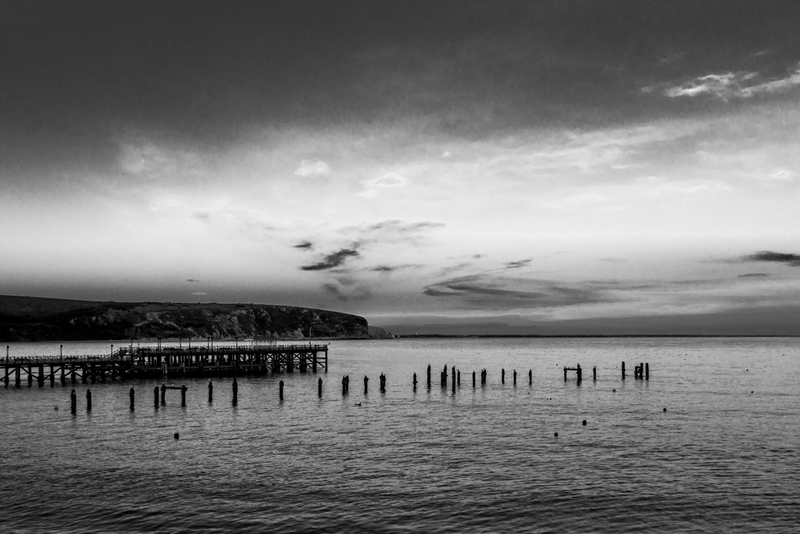 It captures both of the Piers in Swanage Bay looking towards Ballard Down and the famous Old Harry Rocks. Both the Old Pier and Old Harry are very popular with all the local photographers as well as the visitors. The sky never fails to deliver. From moody grey to textured clouds through to stunning colours at sunrise. I look forward to posting more over the coming days.